Jamaica's booming tourist industry is fueled largely by the world's love and fascination for Reggae Music and Jamaican culture. Tourists come to enjoy Jamaica's many festivals, including Sunsplash (which has also toured multiple times outside of Jamaica), Sumfest, Rebel Salute, Sting, White River Reggae Bash, among others. Not only has reggae become Jamaica's largest cultural export, but the large Jamaican and Caribbean communities in the United Kingdom (London and Birmingham particularly) have made the UK the second-capitol for reggae. Germany, France, Italy, many parts of the US—especially the coasts, plus Hawaii...Brazil, Argentina...all of these nations are skankin' and swayin' to the beats of their own native reggae bands. Most notably throughout the past 5-7 years, the U.S. Virgin Islands have been producing a new wave of strictly conscious roots reggae music. If there is any singular icon representing reggae music, it is Bob Marley. 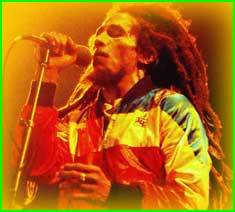 Many reggae fans are indoctrinated into the world of reggae by way of the music from "The King Of Reggae," Bob Marley. Marley's music and image can be found in all of the corners of the world, from college dorm rooms in the Midwest, to secluded beach cafes in Thailand, on the flags of freedom fighters in Africa, to stickers on the sides of festival drums in Brazil. It is said that his image is the most recognized of any celebrity or star throughout the entire world. His music strikes a chord with people of all races, colors, and creeds: "Get Up, Stand Up," is a call to freedom fighters everywhere, just as "One Love" is a simple and unabashed call for unity amongst all people. "Waiting In Vain" is one of the best lovers' tracks in the whole cannon of love songs, reggae or otherwise. Time Magazine notes the EXODUS album as The Best Music Album of the 20th century. Bob Marley started his singing career as one of the original Wailing Wailers, along side Peter Tosh and Bunny Wailer. They came up, as did so many of the Jamaican greats (such as Burning Spear, Joseph Hill of Culture, The Abyssinians, The Skatalites, Ken Boothe, John Holt, Alton Ellis, to name a few) under the wing of Coxsone Dodd and Studio One. The Wailing Wailers' early tracks were ska numbers, soon followed by the slightly slower rock steady, and finally The Wailers helped to originate what we now know as reggae—slower tempos, heavy bass, the rich syrupy musical feel, and most notably a spiritual emphasis centered in Rastafarian consciousness. Bob Marley still remains today arguably the biggest proponent for introducing Rastafari consciousness to the masses worldwide. Bob Marley actively incorporated elements of blues, rock, funk, and R&B into his music, in hopes of crossing over and reaching American, European, African, and ultimately worldwide audiences. Although Jimmy Cliff scored big hits in the United Kingdom before Marley, Bob was the first "Third-World" Superstar to reach the world stage. Ska The original sound of reggae (pre-reggae), played in Jamaica in the early 1960's, originated largely by the island's resort and studio players who came together to form The Skatalites. The early hits from The Wailing Wailers, such as "One Cup Of Coffee," "Simmer Down," and the original "One Love" are all great examples of ska featuring vocals. (A large part of original Jamaican ska was instrumental—check anything from The Skatalites! The Skatalites were the instrumental backing band for some of the early Wailers' tracks.) Ska relies heavily on the saxophone, trumpet, and trombone to carry the melodies, and has a prominent steady upbeat carrying the music forward. Lovers' Rock The love songs have been there since the beginning, since ska and rocksteady, through Foundation to the present time. Roots/Foundation artists considered to be kings of the lovers' genre are none other than Dennis Brown and Gregory Isaacs, as well as Freddie McGregor and Beres Hammond. Lovers' Rock woos the listener with sweet singing and beautiful melodies. Maxi Priest, Sanchez, and Bitty McClean are some of the better-known modern Lovers' singers. Dub Dub is one of the wild sides of reggae—originally the B-sides, to be sure. Dub music started as instrumental versions ("version") on the B-sides of popular 45rpm 7" singles. Early on, the sides were versions with the vocals dropped out, and not much if any other alteration. Dub quickly gave way to more experimentation as early pioneers King Tubby, Lee "Scratch" Perry began to play more with the levels in the mixes, dropping in and out the parts, and most importantly incorporating increasing amounts of reverb, delay, panning, and phasing—the engineer and mixer become the musical artist with clever deconstruction and re-construction of the original tracks—Dub would give rise to the Deejay styles (which would move into Dancehall/ Ragga), hip-hop, electro-dance styles, re-mix, and much more in the way of experimental and electronic forms of music. King Tubby, Scientist, Lee "Scratch" Perry, Linval Thompson, Gussie Clark are some of the classic dubbers, while Mad Professor, Bill Laswell, Adrian Sherwood, Dub Syndicate, and Twilight Circus Dub Sound System (among others) are some of the artists bringing dub into the 21st Century. Deejays The Deejays are the original rappers! These intrepid singers would get up and "toast" or chat and chant over dub-plates or instrumental versions of popular reggae riddims, usually played at sound-system dances. Not to be confused with radio host DJ's (selectors), the Deejays, in the likes of U-Roy, Big Youth, Dennis Alcapone, and Lone Ranger, were pioneering a new vocal art form and style (styles!) as they performed. Most of their work was done over the B-side "versions" of 45's being spun in the popular street dances and dancehalls in Jamaica starting in the early 70's, and continuing through the 80's to the present day. The original Deejays, from the U-Roy's 1970 hit, "Wake The Town" precede hip-hop by about 10 years—it was the Deejays that began the art of mixing vocals over turntable tracks. While much of the Deejay work may still convey some of the messages from the Roots/Foundation sensibility, the Deejays tend to mix in more fun, playful lyrical elements, vocalizations, "bims, bings, brapps, and ripbits!" The songs indeed bring some of the tongue-and-cheek humorous traditions from calypso into the mix, reflections on the times through clever and wry lyrics; and of course—the self-aggrandizing reminder of how great the performer is on the soundsystem mic. The Deejays have a gift for delivering social commentary with a lick of fun too, a smile with your food for thought. Dancehall Some of the most distinguishing features of Dancehall versus Deejays include faster tempos, and a stripped-down approach to the riddims, including the introduction and growing predominance (from the early 80's) of digital sounds and instrumentation. The Dancehall vocal style is still a Deejay or Singjay style, with a blending of chanting, chatting, or toasting infused with singing. Yellowman is an early king of Dancehall. Also bringing in the new era are performers such as Sugar Minott, Wayne Smith (with "Sleng Teng" heralding the digital age), Tenor Saw, Eek-A-Mouse, Supercat, Ninjaman, and Charlie Chaplin to name a few. Dancehall is an interesting term for the genre, since so much of the development of classic reggae and deejay style took place IN the dancehalls and street dances. The dancehall is where The People heard, moved, grooved, listened to, and loved whatever fresh was coming out of the Kingston studios, from the ska days on forward. Perhaps this is where the term Dancehall surfaces as a genre, in that it is often the common experiences of life that are reflected in the subject matter of Dancehall. By the early '80's, the Dancehall style is getting harder and more raw, reflecting the raw and harder economic and social times in Jamaica. Much of the subject matter strays away from the spiritual messages of Roots Reggae, focusing instead on gun and gangster themes, sexually explicit lyrics, homophobia, and hard-knocks living. Towards the early and mid '90's, the rise of "conscious" lyrics, Rastafari consciousness, spiritual themes, and uplifting messages make a noticeable return through the works of artists such as Garnett Silk, Anthony B, Capleton, Sizzla, and Buju Banton, to name a few, who have in turn opened the doors for a new generation of "conscious" performers. Today, many of the styles and sub-genres of Reggae converge to blur the lines, defying neat categorization and labeling. At its heart and root, Reggae music is still "Rebel Music," not always easy to pigeon-hole. Artists and producers forge ahead, incorporating elements from Salsa music, flamenco, R&B, hip-hop, rock, electronic dance, and beyond, into the still-growing form that we call reggae. Dancehall deejays may voice over the deepest dub beats, or singers may make new melodies over classic riddims. Most notable on the world stage today are artists who uplift our consciousness and inspire with cultural and spiritual messages, and those who can deliver "reality lyrics" in a clean, edifying way. Luciano, Mikey General, Warrior King, Junior Kelly, The Marley Brothers (Damian "Jr. Gong," Stephen, Ziggy, Julian, and Ky-Mani), Richie Spice, Everton Blender, Midnite, Bambu Station, Sister Carol, Queen Omega are just some of the artists who come to mind, but—the list goes on! Originators such as Toots & The Maytals, John Holt, Ken Booth, Bunny Wailer, The Abyssinians, The Wailers Band, Steel Pulse, and The Mighty Diamonds still perform (and some still record) to this day. Reggae music is reaching maturity as an art form, even as it still evolves. Reggae's appeal is worldwide, and reggae is here to stay. "And God said, Behold, I have given you every herb bearing seed, which is upon the face of all the earth, and every tree, in the which is the fruit of a tree yielding seed; to you it shall be for meat." (Genesis 1:29). "Ital" refers to diet, but also may infer a wider ideal of purity, all again stemming from that which is put into the body, or Jah's temple, the "Structure." An Ital diet includes natural vegetarian or vegan foods (avoidance of all animal and dairy products—although some Rastas do eat fish), prepared without salt, additives and preservatives, and no processed flour or sugar. Similar to a kosher diet, pork and shellfish are foods that are prohibited in the Ital diet. Strict avoidance of alcohol, fermented drinks and foods, as well as grapes and other foods from vines are also practiced. Also shunned is processed tobacco, but welcomed is Sensimilla, for both eating and smoking. Cannabis being an unadulterated herb (some bearing seed), is welcomed as a God-given gift, a sacrament unto The Most High Jah. Pure, organic foods, unrefined foods are central to the Ital diet, and are said to be closest to the essential Life Force, especially as no killing or blood is involved in Ital "livity" (Rasta living). As ordained in Genesis 1:29, the Ital diet is a natural path reaping only that which grows naturally upon the Earth. Adherents to the Rastafarian faith let their hairs grow together, to "dread," or "locks up." Dreadlocks symbolize a Rasta's covenant with The Creator, Jah, and natural ways of life and living. Although there are many cultures through time that have practiced dreading the hair, Rastas sight the Bible for the inspiration to let the hair form dreads. Many Rastas take The Nazarene vows (Numbers 6:5) which include the doctrine: "there shall no razor come upon his head. Until the days be fulfilled in that which he separated himself unto Jah, he shall be holy, and let the lock of the hair of his head grow long." Also from Leviticus 21:5: "They shall not make baldness upon their head, neither shall they shave off the corner of their beard, nor make any cuttings in the flesh." Rastas may make the distinction between a "dread" (a person merely sporting dreadlocks as a style) and a "Rasta" (one who follows a clean, Ital way of life, and praises Hailie Selassie). "You Don't haffi dread to be Rasta," (Morgan Heritage). "Although I've lost my dread, I haven't lost my sight. And until my day of rest, I will follow your light" (Pato Banton). "It's not the dread upon your head, but the love inna your heart, that mek ya Rastaman" (Sugar Minott). The Rastafarian Patois tends to borrow and change words from English, uplifting some of the sounds found therein. "I" replaces me, and "I and I" for you. Rastafarian scholar E. E. Cashmore writes: "I and I" is an expression to totalize the concept of oneness, the oneness of two persons. So God is within all of us and we're one people in fact. I and I means that God is in all men. The bond of Ras Tafari is the bond of God, of man. But man itself needs a head and the head of man is His Imperial Majesty Haile Selassie I (always pronounced as the letter "I," never as the number one) of Ethiopia." Rastas will "livicate" instead of "dedicate," taking "dead" out of the equation. "Oppression" becomes "downpression," as the "Up" sound is replaced by "down" in regards to physical, spiritual and/ or mental burden. "Enjoy" becomes "full-joy," as "En" takes on the sound of "end, or end-joy." "Appreci-love" replaces "appreciate," negating the sound of "hate" in "appreciate."